A1611 Eveready 206 Mallory TR-126 Battery equivalent to TR-126, ER-206, E-126, E126, 206, NEDA 1611, 1611M, H-7D, 7MR9, B206/L6. Length: 50.8 mm. Diameter: 19.3 mm (note was previously 18.6 mm). Price: £13.49 each. £12.99 each if you buy two or more. Postage and packing included. Also known as: Duracell TR-126, Eveready ER-206, E-126, E126, Mallory 206, NEDA 1611, 1611M, Panasonic H-7D, 7MR9, B206/L6, Sony 7MR9, Panasonic H-6D, 6MR9. 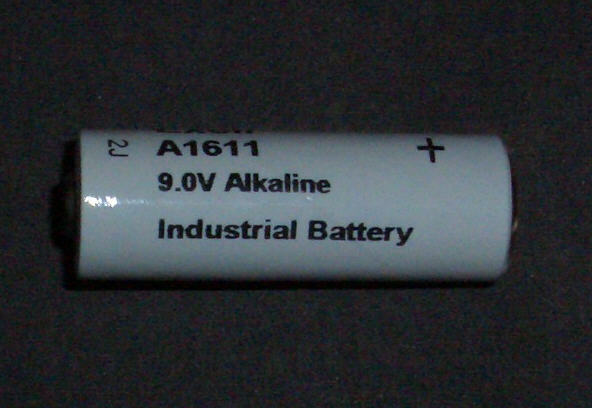 This A1611 battery is alkaline and cylindrical; it is more or less the same length as a standard AA battery but fatter. It produces 9 volts. It is the perfect replacement for the hard to find Eveready 206. PLEASE NOTE: The design of this battery has changed. It now exactly replicates the Eveready 206 with a thicker diameter of 19.3 mm. So it is slightly thicker than a TR-126 and E126. So take the compatible applications listed below with a pinch of salt and check the dimensions of your battery compartment before you purchase. It successfully replaces mercury versions denoted as 9.45 Volts (H-7D, 7MR9) and as 8.4 Volts (E126, H-6D) . This 206 sized battery fits Nakamichi (Nak) CM300 microphones better than the Energizer version. This 206 equivalent battery can also be used in a number of old collectible radio sets like the Arvin 61R39 and Magnavox AM-80. Also phantom batteries for C-76 Mic, Sony C74 microphone C76, C-74 and the Syncron Model S-10 condenser microphone. These 206 batteries have a shelf life in excess of four years. Why not buy two or more packs, take advantage of our reduced price and make sure you are not left unable to use your device next time your battery runs out.